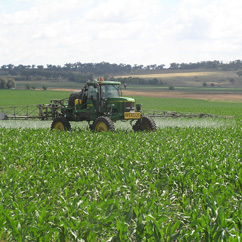 Farmers, property owners and other chemical users in South Australia have contributed to one of the largest collection of agvet chemicals since the ChemClear program began. A true testament to their commitment to the environment and best practice use and disposal of their chemicals. 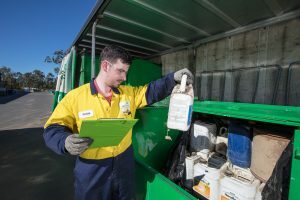 More than 28,000lt/kg* were registered with ChemClear and delivered to collection sites in South Australia’s June collection. ChemClear program manager, Frank Wimmler, said landowners demonstrated they were prepared to put good intentions into action, with their commitment to environmental safety in the agriculture industry. For many farmers and rural property owners, the problem of disposing containers with unknown chemical residue often presents as an unwelcome surprise when they buy or sell a property. Managing the dangers of hazardous substances seeping into soil and waterways is one many landowners face when they find unlabeled, unknown chemicals hidden in sheds or paddocks. The unwanted or obsolete chemicals also pose a potential risk to children, land workers, livestock and pets. SA farmer, Andrew Smith, who swapped from cereal cropping to grazing several years ago, has registered his unused pesticides with ChemClear. He said the ChemClear service was ideal for farmers who switched crops as a way to keep properties clear of leftover chemicals. “We’ve always locked our chemicals up and after a recent audit we realised there was no need to keep hold of them anymore, so ChemClear is the safest way to get rid of them,” Mr Smith said. Agsafe is an Australian non-profit organisation offering programs to support agvet chemical product stewardship: Accreditation and Training, drumMUSTER (container recycling) and ChemClear (chemical disposal). ChemClear fosters the safe removal of approved, registered Group 1 chemicals and unknown, unlabeled Group 2 products by way of environmentally-sound disposal solutions. Chemists take delivery of the chemicals on-site, then sort and safely pack the containers in metal bunded bins for transport to chemical processing plants in either Brisbane? or Melbourne. The chemists test and decant similar chemicals into vats for processing, then transported to plants where complex chemicals are broken down into simple, safer components. Agvet chemicals have a calorific value and when mixed with other flammable wastes, they can be used as an alternate fuel source for cement kilns. For more information phone ChemClear on 1800 008 182.